The financial recession of 2008 – 2009 resulted in a 39% decrease in the city’s construction workforce between 2008 and 2011. Simultaneously, the office commercial real estate industry felt a slowdown in leasing activity and subsequently, a decrease in the number of interior office space construction projects. 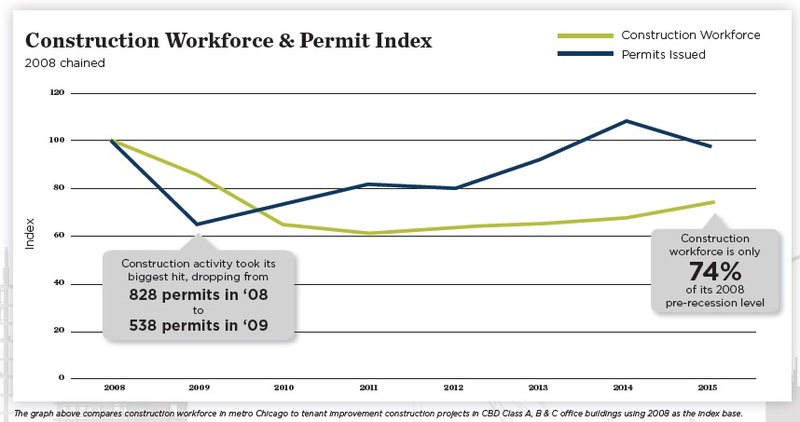 From 2008 to 2009, the number of permits issued in the city of Chicago for office space interior build-outs decreased 35%. 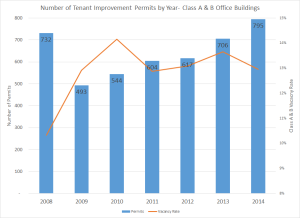 As the economy began to recover, the number of permits issued from 2009 to 2015 jumped 50%. As of 2015, the number of construction permits issued returned to pre-recession levels, yet the increase in the construction workforce has lagged the permit trend. Construction labor in Chicago is only at 74% of its pre-recession levels as of 2015. Cushman & Wakefield believes the shortage in the construction workforce is a major contributor to the recent trend of increased office space construction costs. Since 2009, the total permit value has increased 65%, while the city’s construction workforce has decreased by 13%. Until demand for construction work decreases, or there is a substantial increase in the construction workforce, construction costs will remain high as compared to previous years. Because of the scarcity of field labor, the local labor pool will be supplemented with less experienced trades and out of town labor that will be less productive in delivering the project. Construction projects that previously had a duration of 75 – 90 days may now take 90 – 130 days to complete. As construction costs are rising and the typical standard build out costs are 10% – 15% higher than the previous 12 – 18 months, an experienced project management team will provide essential detailed budget expertise and value engineering options to ensure target financial goals are met. With the right real estate team, a substantial reduction in rentable square footage can be achieved by implementing new workplace strategies that will reduce overall real estate costs. Alternative choices, such as spec suites (landlord pre-built office space) or an existing space with reusable construction and furniture may reduce project costs and minimize potential schedule risk. Scott is a senior director at Cushman & Wakefield. He has been an office tenant representation broker since 2003.